Here in the U.S. we will be celebrating Thanksgiving on Thursday, November 25. 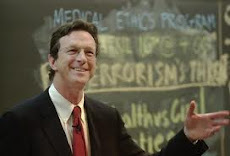 Among the many things to be thankful for is Michael Crichton’s life and work. Though it is sad that he is no longer with us, his books, films, essays, and various other projects will continue to entertain people and challenge their thinking. "He's very laid back," Ballard said of Crichton. "He's not a socialite. He just wanted a restaurant-quality lifestyle without ever having to step foot out of his house. "It's interesting to see how very successful people deal with life," he added, "how they treat people, in particular." Ballard misses the quiet conversations he used to have with the author, but he chose not to go along when the Crichtons moved to the West Coast. In the 2003 article Star-Power Holiday Meal, Ballard shared the recipes for some of Michael Crichton’s favorite dishes. What would a typical holiday feast consist of at the Crichton home?...The standard on the Crichton’s holiday table is roasted Mahogany Duck. I feel that duck is a good change from turkey. After Thanksgiving you really don’t want to serve turkey again. The Crichtons love the duck. No proper holiday fare is complete unless concluded with English Sherry Trifle. Michael Crichton loves this dessert. After days on end of writing feverishly for each book, this was his singular treat. When Sean Connery was awarded the Cecil B. DeMille award at the 1996 Golden Globes, Michael Crichton was one of the presenters. He was the one who handed Connery the award. It’s a special honor receiving this award from Michael. You know, multi-talented is a much-abused term in our profession. But Michael is the only man I know who can write bestsellers with one hand and take out your appendix with the other hand. I get the chance to get in the same room as lots of friends. I’m always trying to catch up to Michael, who I adore. He’s got a very big influence on my life….I’m interested more in writers and directors than I am in actors as a rule. I really have a terrific measure of affection for Michael here because I wasn’t joking out there when I say he can write bestsellers and take out your appendix. Because he reminds me so much of Umberto Eco in that he’s got all the elements that I adore. Terrific mind, good writer. He’s had an enormous effect on my life. He’s one of the few people that I can remember things that he said in passing while we were walking down the street 25 years ago. I haven’t been able to find a clip or a news story of what Crichton said about Connery before presenting the award. I remember seeing it on TV when it happened. If anyone knows, please let me know. Unfortunately I haven’t been able to finish my tribute. In addition to the grief over Michael Crichton’s death, I’ve been dealing with another as well. A very close friend of mine died of cancer two months ago today. She was 48 years old. I had known her for nineteen years and she was the closest thing I had to a sister. When I try to work on my tribute to Michael Crichton, I end up thinking about my friend as well. The sadness multiplies and overwhelms me. Too many good people have been lost to cancer. How many more? I will finish and post my own tribute when I am able. In the mean time, I’ll post other things of interest about Michael Crichton. Sorry for the delay, and thank you for your patience. I wanted to let you know that I’m taking a brief break after posting so consistently recently. I should be posting something new either tomorrow or Monday. I’ll discuss it later. See you soon! Featured today are tributes from two people who never met Michael Crichton, but corresponded with him online. I started out with Macs back in the 1980s and since then I've never met anyone who could persuade me to switch or any particular piece of software that would obligate me to purchase a PC. Your site is great. Tell me where to send a check. Michael, thank you for the wonderful entertainment you provided over the years—and for the individual support you provided to some guy running an OS X Web site as a hobby back in 2001. The world has lost a great talent, and you will be sorely missed. I corresponded with Michael Crichton by e-mail for over a decade. Several years ago he did the unthinkable -- he helped my daughter, Annette, write her summer book report on "The Andromeda Strain." I was so stunned by his note to her I could only reply, "Your kindness is inspirational." This past May he gave me hiking suggestions for my trip to Hawaii. I say these things to shed light on the true gentleman who was more than a writer, filmmaker, or essayist. He was an inspiration, a role model, and a towering intellect who will not be duplicated. In November 2005, I participated in an online discussion with Michael Crichton hosted by Barnes & Noble. He was very gracious, and, of course, utterly fascinating. I will always cherish that experience. Michael and I were good friends at the time when I first started exploring intuition and spirituality in the early 1980s during my psychiatric residency at UCLA. Michael had a wonderful dog he'd take with him. One day his car got stolen and the dog was in it and he was so upset. Thank goodness both were found! Michael had a big heart, a wide open imagination and was a great buddy for me.